Indie Retro News: Counterweight Kate - A bouncy C64 game is in development, release date April 2018! Counterweight Kate - A bouncy C64 game is in development, release date April 2018! 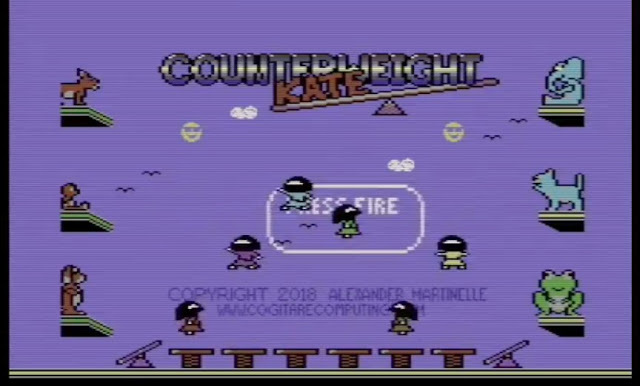 L'abbaye Des Morts isn't the only game coming to the C64 as we've recently been informed Cogitare Computing's game of Counterweight Kate, which is being developed by Alex Martinelle, is set to be released this upcoming April 2018. If you love platformers, then this is the game for you, as not only does it feature 12 levels of bouncing fun but it has a lovely tune to keep you going through the day! According to the developer in this game you play as Kate who after waking up from a rather lovely sleep, has found out that all of her toys have come alive. Now it's down to you to rescue all 6 of her cuddly friends, while avoiding all the baddies found throughout.